In December 2018, we set out to explore the future of town hall meetings. 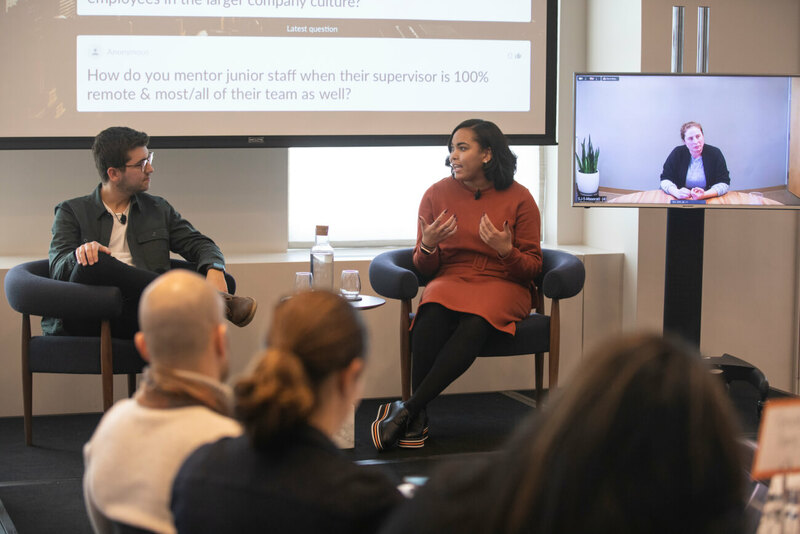 The goal of our one-day event in partnership with Convene was to show how a successful all-hands could look in 2019 and beyond by using interactive technology and meeting design thinking. As a part of that strategy, we asked two of our speakers to become virtual panelists at our event. It was a new experience for everyone, and the audience loved it. Here are some of our key learnings. 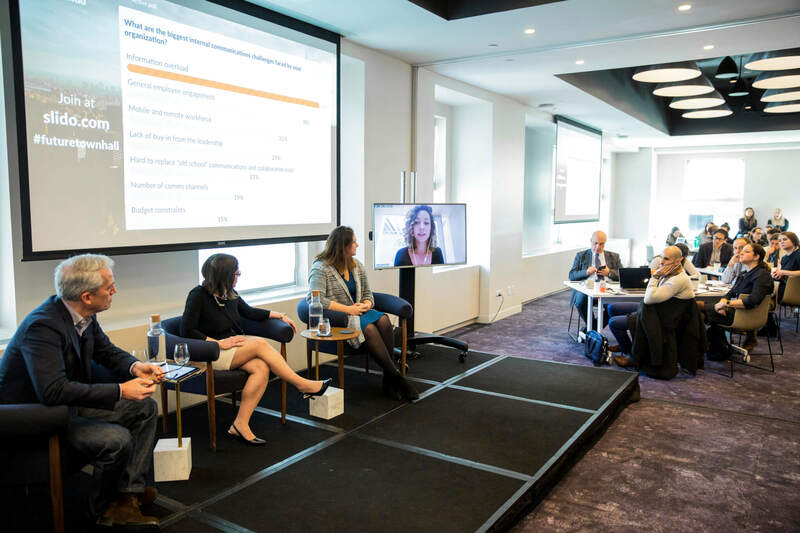 The remote panelists joined our New York event from the opposite side of the continent – San Francisco and San Jose. Each of them joined a different discussion, so it was always one online presenter per panel. The remote speaker was live-streamed on a screen next to the other panelists on stage. There were two more presentation screens in the room where the attendees could see the online speaker along with the audience questions on Slido. The stage of our Town Hall of the Future with Hannah Lawrence from Zendesk as a remote panelist. We used Zoom to connect with the remote presenters and transmit the audiovisual feed from the room online and the other way around. So how did it go? Here’s what the moderator, the remote speaker and the audience told us after the event. For the panel moderator, our own Juraj Pal, it didn’t feel too different from moderating a regular panel discussion. To facilitate the session more effectively, the most important factor for Juraj was the ability to see the remote speakers directly. It allowed him to check whether the online panelists were following the discussion and to create a space for them to talk. The second panel joined remotely by Priscilla Barolo of Zoom. Learning #1: Set up the stage screen so that your moderator has a clear view of the remote speaker. 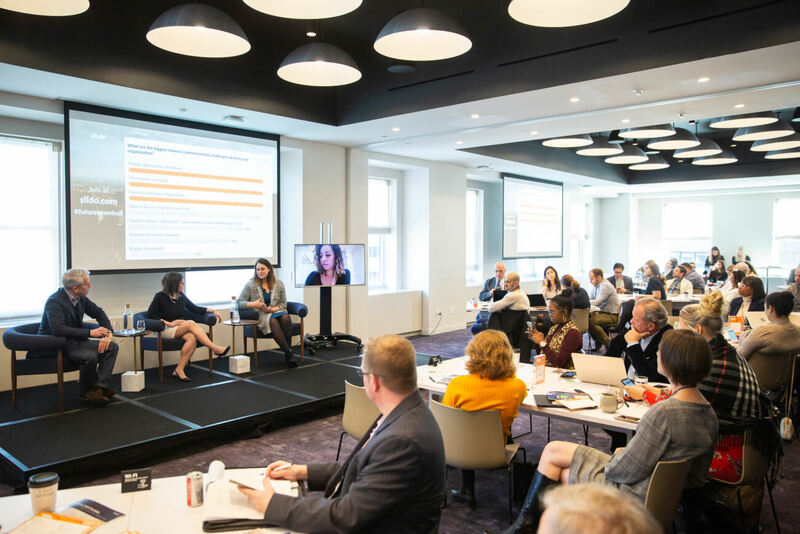 A good solution would be to put the video feed on the confidence monitor with a camera streaming a close-up of the panel, so the moderator can address the remote panelist directly. Learning #2: Always have a camera angle on the participants to help the remote speaker gauge the atmosphere in the room. Being able to read the non-verbal cues is crucial for speakers to see if the people understand their point. From the feedback we collected after the event, we saw that people were positively surprised by what’s possible. But they also identified one technical drawback. Those sitting farther away from the stage found it difficult to see the remote panelist on a small stage screen. Plus the video thumbnail displayed on the additional screens was not big enough to see the speaker’s expression. Learning #3: Make sure you have enough screens so that everyone in the room can see the online presenters comfortably. Once they start speaking, put them on fullscreen to make them more visible from every corner of the room. Connect your AV technician with the remote speaker a few days before the event. The purpose is to brief the presenter about the meeting software used, learn about the technical possibilities and prevent any unwanted issues. Make sure the connection works on both ends. Test the technology from the same location, network and computer that will be used on the day. 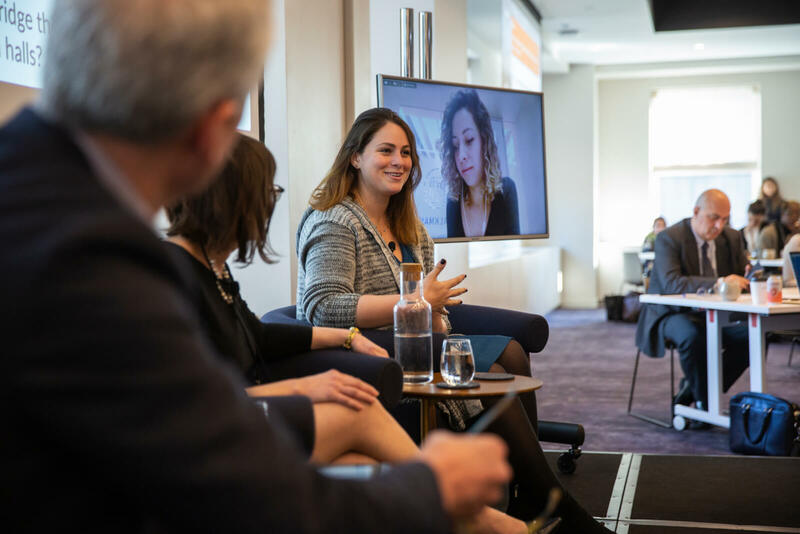 Advise your first-time remote panelists to avoid striped or patterned clothing, find unobtrusive backgrounds and wear clothes that contrast with the background. Send a Slido link to the online speakers if you plan to use it, so they can monitor the incoming questions. Have you ever hosted remote guest speakers at your event or panel? We’d love to hear about your experience. Feel free to hit us up on Twitter or LinkedIn.